It was in the middle of April when we’ve visited Switzerland for the first time in our lives. We haven’t really planned to visit it this year, but we had a chance to extend a business trip with a week and of course, we just couldn’t miss a chance like that. And for us Switzerland means the wonderful Swiss Alps in the first place, so it was obvious that we wanted to conquer some snowy high peaks. We had our chance for that while staying in Lucerne. 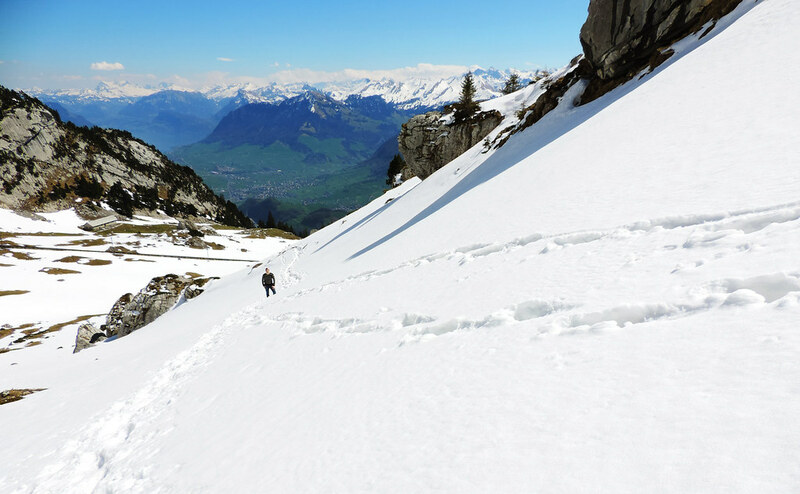 The middle of April is not yet ideal for hiking in the high mountains, because the snow line is around 1500 meters and snow can be very deep at higher elevations. Most of the summer hiking trails are still officially closed. But hey, what about winter trails and snowshoe hiking? We’ve done some research, picked some possible options and got excited (especially this last one…). How to access the trailhead? The easiest and fastest way to get to the trailhead was taking train S5 from Lucerne Bahnhof to Alpnachstad. It’s a 20 minutes long train ride along beautiful Lake Lucerne. The trailhead is right behind Alpnachstad train station, next to the cogwheel railway which also goes to Mt Pilatus summit (but it operates only from May to November depending on snow conditions). Just look for the yellow sign indicating ‘Pilatus-Kulm’ – you should follow this sign all the way up, it’s hard to get lost, because signs are posted whenever the direction is not obvious. The trail starts with stairs, then it leads through alpine meadows. The scene what we’ve seen was the one we’ve always had in our minds when thinking of Switzerland: lush green meadows full of cows and small villages in the distance. And it was real! 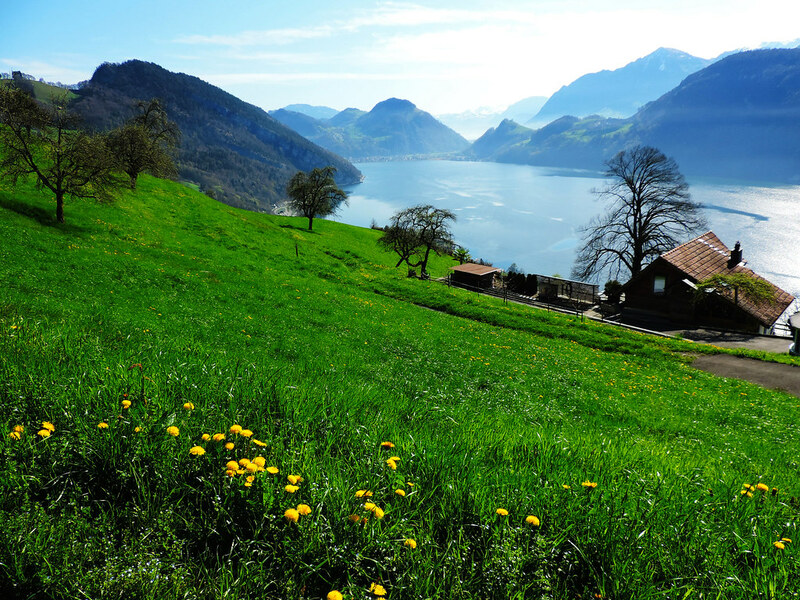 Like this alpine scenery itself wouldn’t have been enough to take our breath away, the meadows were full of blooming wildflowers in a variety of colors: yellow, red, pink, purple, blue… And the views of Lake Lucerne below us became more and more stunning with every step we took. 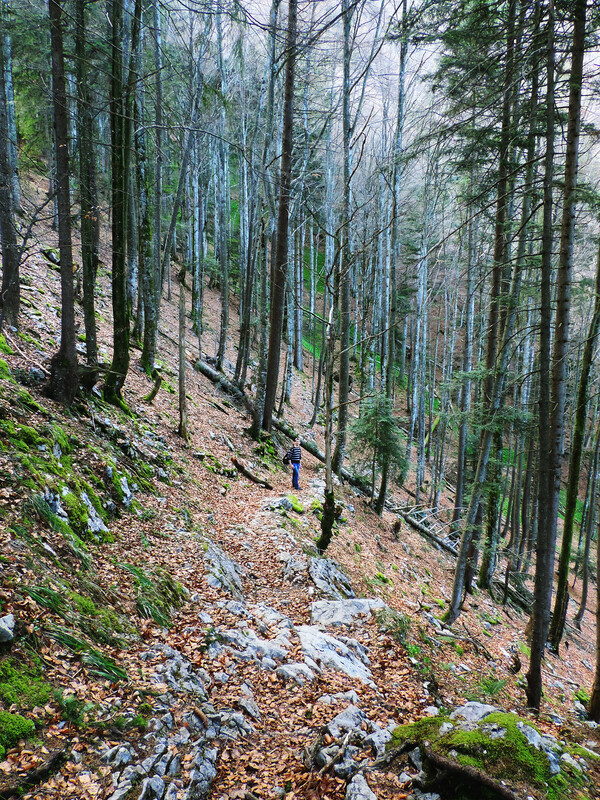 Then we reached the forest where the trail gets steeper. The trees were still mostly bald, but the forest floor was decorated with lovely wildflowers. Then there were more and more pine trees and finally we left the forest behind. And in that moment we’ve seen it all: the inlets of Lake Lucerne below us with the hills and peaks surrounding it, hundreds of high peaks in the distance still covered with lots of snow and lush green meadows between the white peaks. 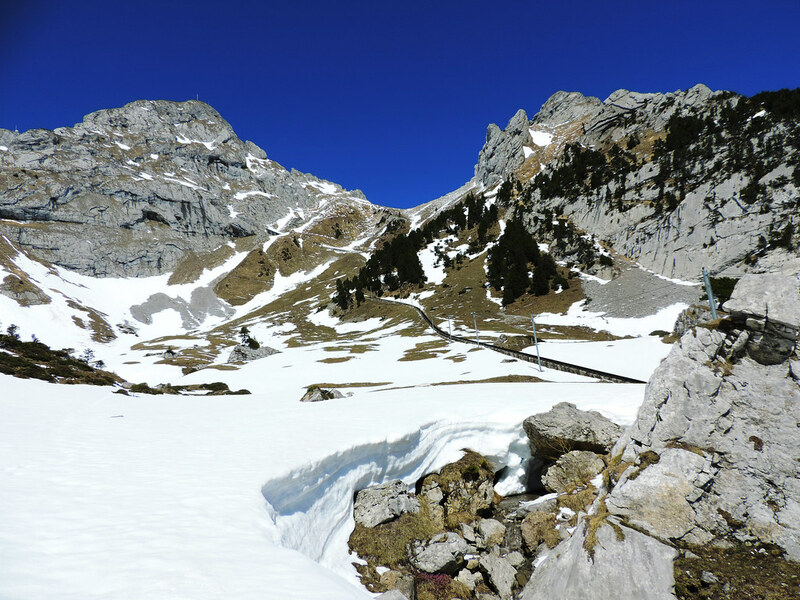 This was the panorama from a small picnic area which is exactly halfway on the way to Mt Pilatus summit. We’ve reached this point after 2 hours of hiking – which is exactly the same as the official estimation (which means that though we love hiking like crazy, we are still average in terms of performance). 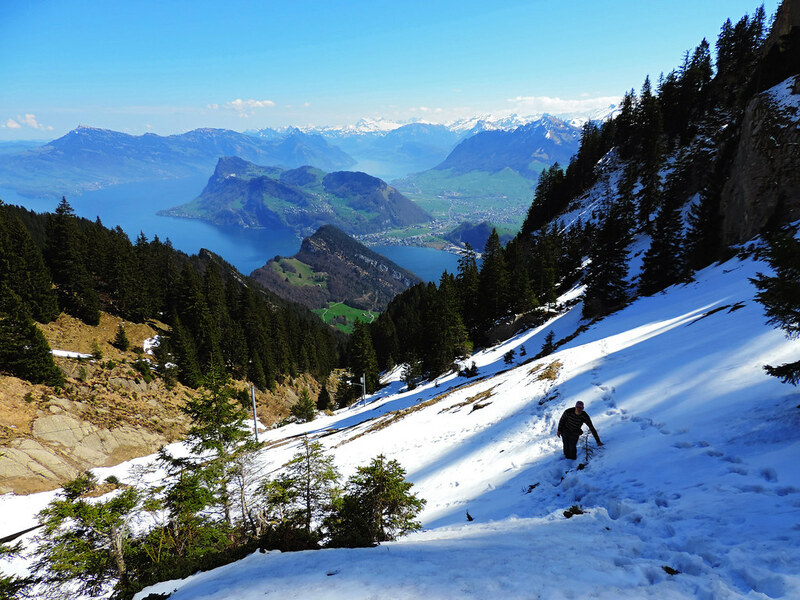 So we have continued our way up to Mt Pilatus summit and soon reached the snow line. From the traces in the snow we could obviously tell that several people did this hike since the last snowfall. So no worries. Most of those people were likely locals though. We have hiked after quick spring snowfalls in the United States previously, but this hike was our second time hiking in such deep snow (and the first was the day before). Deep means mostly solid ankle-deep snow, sometimes randomly knee-deep and very rarely thigh-deep (oh, what a funny surprise that was from time to time). So we were cautious. Okay, maybe even a little bit scared sometimes. Our waterproof hiking boots were all the special equipments what we had. If we don’t count our special crazy soul. 😀 But at about 3/4 of the entire hike we have completely lost track of the trail in the deep snow. We’ve seen traces, but the terrain got so steep and slippery that we didn’t feel comfortable anymore. So the snow conquered us: we turned back. Maybe we would have been able to do the hike up to the summit. Others have done it, it was obvious from the traces in the snow. But what if we couldn’t? 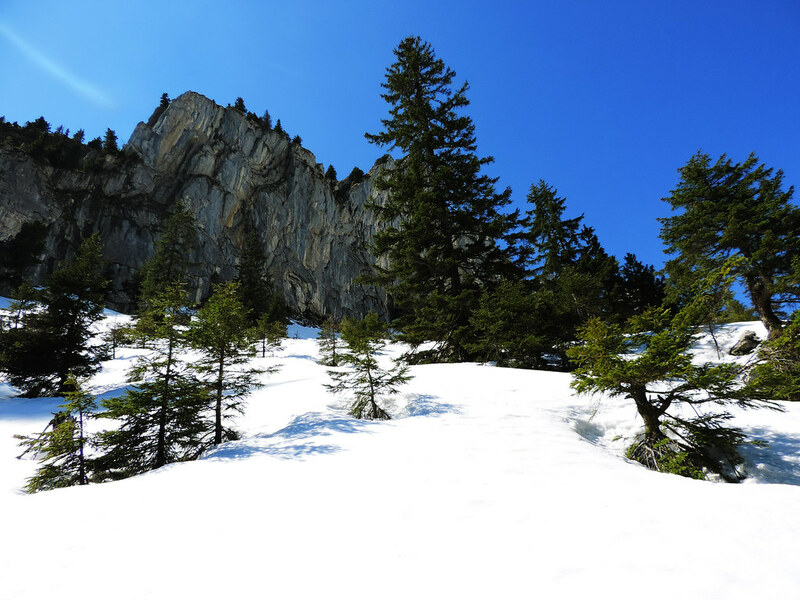 We haven’t taken the risk and probably it’s for the best as we are not even experienced in hiking on snowy terrain. Our answer is an obvious YES. Though we missed the feeling (and the view) of looking down from the summit, but the panorama was actually stunning all the way and hiking in the snow was also great fun (until the point we turned back). We could be more prepared next time – like having hiking sticks could have been very handy. And we could go back in late spring or summer next time. Because we are sure we will. Swiss Alps is a place to return! 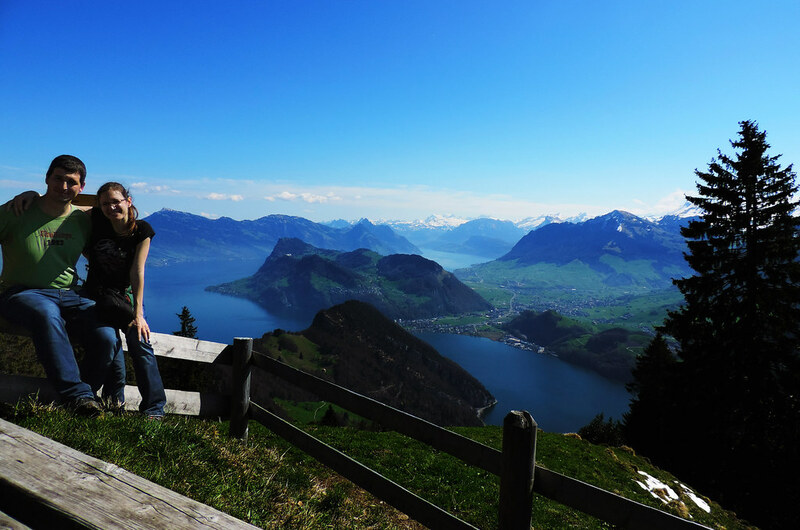 Alternative ways to Mt Pilatus summit: cogwheel railway from Alpnachstad; gondolas and aerial cableway from Kriens (year-round except maintenance period) – more info here! 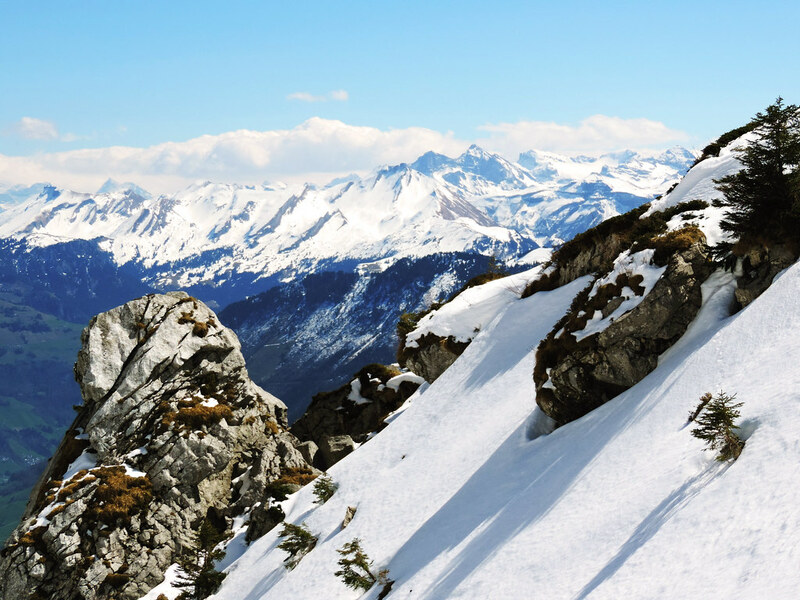 Have you ever hiked in the Alps? Do you have a favorite hike? Previous post How NOT To Quit Your Job And Travel?